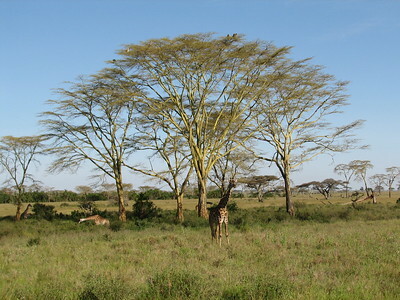 Serengeti National Park is a 60,000 square kilometer large area of savanna and open woodland. It is home to the largest herds of grazing animals in the world, including more than 2 million wildebeest, 900,000 Thomson's gazelles and 300,000 zebras. Predators are ca. 4000 lion and 1000 leopard. The Serengeti hosts the largest and longest overland migration in the world, a biannual occurrence. Around October, nearly 2 million herbivores travel from the northern hills toward the southern plains, crossing the Mara River, in pursuit of the rains. In April, they then return to the north through the west, once again crossing the Mara River. Kenya's Masai Mara National Reserve also is part of this Serengeti-Mara ecosystem, and IUCN recommended an extension to add this part. At 8 a.m. we leave for the day-long safari through the Serengeti. Our lodge, the Ndutu Lodge, lies outside the boundaries of the park and therefore we must first take a ride on the plains until we reach the Naabi Hill Gate. Underway we already see plenty of animals, especially a lot of gazelles and the first hyena. The Serengeti seems a big dry plain but there still are some small pools of water. In one of them about twenty hippos are submerged. They look like a group of stones as they have their heads under water. Only very occasionally, they show their nostrils above the water line. The first real predators that we see are the Cheetahs. First four at some distance, and then another two fairly close. They were sitting under a tree but when they see the jeep they walk away slowly. The park also has many different kinds of deer and antelope. In addition to the ubiquitous gazelles we see impalas, hartebeests and Bohor bucks. They all stand around in small groups along the sandy road that we must follow with our jeeps. If a jeep stops, they look up and pull back a bit, but they are not really skittish. Then time has come for the search for lions. Search is a relative concept here, because the jeep drivers have a radio on board to keep each other informed. Also oncoming jeeps are often asked for information. 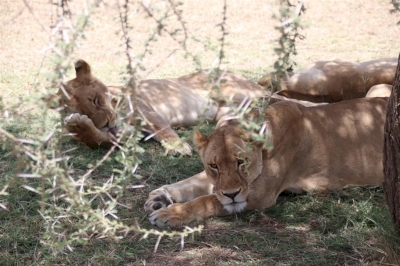 A group of four lions has made itself comfortable in the shade under a big tree. The two males and two females do not even look up when three jeeps stop in front of them. It is so remarkable how close you can come, but these animals are afraid of nobody, and also accustomed to the many jeeps. A bit later we find another couple. This time on their favorite lookout, a “kopje” (rock in the flat land). After a lunch at the visitor center (where you can also stretch your legs because in the park you are not allowed to leave your vehicle), we stated that we would like to see a leopard. “If you're lucky …”, our driver Mouni replies. And we are! Within less than 10 minutes we encounter a traffic jam of jeeps. On a tree branch lies a very lazy leopard. He is close, you can see his spotted hide with the naked eye. We remain to watch him over quite a long time, but he does not move more than to rearrange his leg to lie even more comfortable. Surely the highlight of the day, because leopards are quite rare to see. On our way back to the lodge, we come across two arguing elephants. A jeep is caught in the middle between them (a somewhat unhappy position), but the big beasts have only eye for each other. They are only threatening: one takes a few steps forward and the the other pulls back a little. A few minutes later, it’s the other way around. At one point one elephant in his anger kicks a tree, which is overthrown like a twig. The giants keep on threatening each other but do not fight. We were also lucky to see a number of cheetahs (be it from a distance), a lazy leopard in a ‘sausage tree’ and what looked like a miniature version of the wildebeest migration (an endless stream of wildebeests and zebras crossing the road but only in a single line). Another – be it smelly – highlight is the hippo pool. Although most people visit Serengeti for the wildlife, the surroundings are also beautiful and worthwile to spend a couple of days, so in our opinion Serengeti is one of the top WHS! In terms of accomodation, there are various options: lodges, moving camps (to follow the wildebeest migration), tented camps and camping. Lodges and moving camps are (very) expensive so we opted for a tented camp (the brand new Tukaone Camp), i.e. with fixed tents where all guests have their own large tent with bed, shower, toilet, ... and also a mess/restaurant tent. Although also not cheap at all, we felt we deserved this after spending five nights in a small tent at well below zero temperatures on the slopes of Mount Kilimanjaro. Recently visited Seregheti NP too on our honeymoon in early July (see Ngorongoro Crater NP). Weather was amazing. Mid-eighties and no humidity. Being the dry season the tsetse flies and mosquitos were not a problem. Had timed our trip for the Wildebeast migration. The beginning of our Safari with Thomson tours (without the "p", which I highly recommend) started at Tarangire NP where the migrating herds had left the week prior to our arrival. However we caught up with the herds in the western corridor of the Serengeti NP. Amazing! A vast expanse of grassland inhabited by millions of animals as far as the eye can see. And best of all, not one radio-tower with flashing red lights to spoil the view in the distance. Coming into the park via the Naabi Hill gate and traversing the endless flat plain is truely a sight to behold. You realize what a small speck you are on this earth. I would recommend visiting early/mid-June to avoid possibly missing the herds in Tanzania (they migrate to Kenya). The Kirawira Luxury camp is exquisite. The people of Tanzania are extremely friendly to foreigners and the use of English is spreading rapidly, thus making travel more comfortable for us westerners. I highly recommend seeing this eden. Covered by volcanic ash: The underlying soils and materials of the Serengeti plains are comprised of volcanic ash derived from a number of local volcanoes. The dormant caldera of Ngorongoro, the Kerimasi Volcano and Mt Lengai (last eruption in 1966) have all contributed volcanic ash to these soils (vertisols). These soils have characteristic plant communities, distinguishing the ecoregion from its neighbors. Critically endangered fauna species: Black Rhinoceros - General: "Population size collapsed during the last century, from an estimated 65,000 animals in 1970 to a mere 2,300 in the 1990s. Rhino numbers are now increasing, but recovery is slow"; in Serengeti NP: "very few individuals remain due to rampant poaching"
Foreigner prices: 30 versus 60 USD conservation fee. Residents and East African citizens get the local fee as well.